A torn calf muscle occurs when the muscle fibres in one or both of the major muscles in the lower leg (calf muscles) are subject to a sudden, large force causing them to stretch beyond their normal range of movement which results in a tear(s) depending on the severity. A torn calf muscle can occur when the leg is stretched or twisted with great force such as is common in sports where extensions and sharp turns are necessary. For example, a calf injury could occur in a footballer who jumps high to win a header and lands at an awkward angle. Skiers can also have this problem if they do not stretch or warm up before rapid sprints. Calf muscle tears are usually in three different degrees or levels of severity. 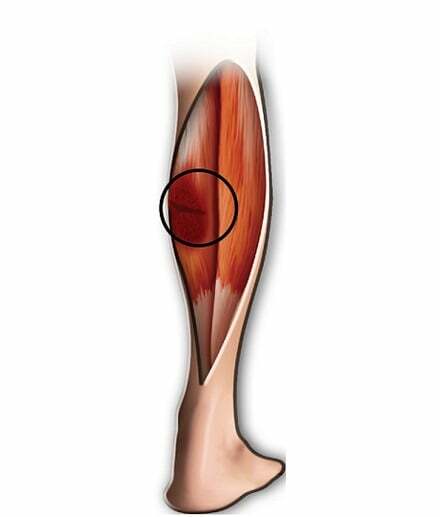 Grade 1: muscle tears are small and pain is not debilitating, if a very small tear occurs, the individual may feel tightness and pain in the leg for a few days but should still be able to engage in certain activities. Grade 2: a larger tear usually occurs, which results in severe pain, tenderness and moderate swelling around the area. At this stage, it would be much harder and not advised to be involved in certain sporting activities. Grade 3: this is usually a severance in the calf muscle and will cause severe pain and swelling that prevents the person from walking, running or jumping on the leg or putting any kind of pressure on it. This level of severity usually required immediate medical attention and most likely surgery to help reattach the muscles. Fortunately, most calf muscle tears usually heal themselves with rest after about two months, the use of certain home remedies, painkillers, and careful rehabilitation exercises can also help to improve the recovery rate. A calf muscle tear can occur when the muscle is pulled or stretched too far and the muscle fibres tear away from the tendon. Often this is when you move your calf suddenly or in an unusual direction. Calf muscle tears are often very prominent in athletes, especially those who participate in rapid movement sports such as tennis, rugby, football, and hockey. They are also common in sports such as squash and tennis because there are sudden sideways movements and lunging from standing. A torn calf muscle can also occur as a result of lack of efficient stretching or warming up, falling awkwardly, or an over aggressive effort to speed up the healing process. It sometimes happens after repetitive stresses or if your muscles have not been warmed up properly before exercise. Pain – sudden and unexpected pain is normal. Typically, the pain radiates down the back of the lower leg, however, depending on the proximity of the tear, pain may also be felt closer to the ankle or the back of the knee. Swelling – after a calf muscle tear, the pain is usually accompanied by swelling where the surrounding muscle is inflamed by the rush of blood. Bruising – it is not uncommon to experience some bruising after calf muscle tear, it is more prominent the higher the severity of the tear. Since all this occur just under the skin, blood is trapped, discolouring the skin. Weakness – weakness or muscle failure in the lower leg is possible, this is often reflected in the inability to point of lower or rotate the ankle or toes. Stiffness – many people may also experience muscle stiffness a short time after the injury which may result in limping, as time passes the stiffness should dissipate. Other symptoms that may also be experienced include a limited range of motion in the ankle and trouble standing on the injured leg. An individual can usually tell when they have a torn calf muscle, due to the sudden extreme pain at the location of the calf possible with an audible “pop” which is often accompanies by swelling and mobility problems. To confirm this, it is essential that a medical assessment is carried out by a doctor. The physician is likely to carry out a physical assessment to determine the extent of the injury and what further steps should be taken. Physical examination – the doctor will look to understand when and how the patient initially experienced the pain and what mode of action caused it. There is likely to be visible bruising to the affected area, and pain experienced if pressure is applied there. The doctor may also ask the patient to try and move their foot around; this will help him or her to see the limitations to their range of motion. X-ray/MRI Scan – these are usually carried out further to the physical examination to determine the extent of the damage and what further steps should be taken in terms of treatment e.g. whether wearing a supportive brace or wrap for several weeks during the healing or using prescription anti-inflammatory drugs to limit pain while the injury naturally heals itself. If it is identified as a torn calf muscle depending on the severity the doctor is likely to refer the individual to a physiotherapist who will further advice on a course of action to strengthen the calf muscles too speed up healing and to prevent a recurrent injury in the future. Ice – Put an ice pack on the area of the calf, which is painful for around 20 minute intervals. You can continue to maintain apply ice swelling in the first 48 hours, if necessary. Compress – Use an elastic bandage to lightly but firmly wrap the injured area. This will help with swelling and relieve some of the pain in the region in many cases. Elevate – Use a cushion to support the calf and keep the injured calf at an elevated position. Sit on a sofa or bed, if possible, and place the leg up on the pillows. This is especially important when sleeping. NSAIDS – Take a mild pain reliever such as ibuprofen or paracetamol which may also prevent further inflammation. Ensure you speak to your doctor before using any not over-the -counter painkillers. Massage – rehabilitate your injury with a sports’ massage when possible with a qualified physiotherapist once your torn calf muscle is no longer in danger, inflamed or irritated further. Check with your doctor before you try this, as doing this too early may exacerbate the problem. The calf muscle is one of the largest and most used muscles in the human body. Connecting the knee to the ankle and foot, it is used in every motion with the legs. People rely on the calf to make to make almost every step, therefore a torn calf muscle can be devastating to daily movement. There are certain actions that can be taken to prevent the risk of muscle tears. Stretching – before any strenuous activity, your muscles need a warm-up, improved blood circulation and elasticity increase before training, they help to prevent injuries in the long term. On the ground sitting with your feet extended in front of you, extend your hands towards your toes gently.This stretches your calves. With your legs together, go on your tiptoes and lower your heel slowly, repeat this about 10 reps.
Start with a brisk 5-minute walk, increase to jogging pace and ultimately running speed. This will help your calves to acclimate the pace of your workout. Increase fluid intake – ensure you drink plenty of water throughout your routine.Water helps to flush out toxins that build up in the muscles and keeps muscles hydrated, reducing the opportunity for tears. Remember to warm down – reduce your activity level slowly at the end of your routine.A sudden stop in a strenuous activity may confuse to a system which can not only lead to the build-up of lactic acid and consequently muscle cramps, but also increase the risk of injury. Walk or jog slowly for a few minutes, this cooling routine helps to flush the toxins built up during activity and helps to keep the muscles in a state of low activity. Refuel your body – your body uses calories and nutrients at work.Restocking these are essential for the growth and maintenance of the muscles. A balanced meal of protein and complex carbohydrates, such as lean chicken breast and brown rice will give your body the nutrients it needs rebuilding and fuel healthy muscle tissue.